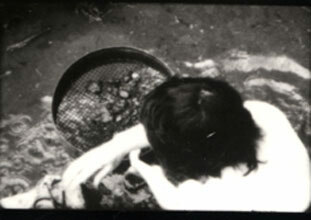 By the time she went to the Slade (1980-2) for her postgraduate degree she had, in these early films, begun to explore some unique aspects of the film medium, such as its framing of the subject in space and its potential for the shaping of time. The film she completed at the Slade, I Dish (1982), retained and expanded this direct and photogenic style, in which ordinary actions are also enigmas. The sparse events in the film - such as cooking and eating a fish - are shown 'out of sequence'. The two protagonists are divided in film space but linked by editing, so that the viewer connects them imaginatively even though they never appear together in the same shot. Finally, a naked young woman in a rock pool sifts stones and hooks, at the very edge of the frame that contains her. The images in the films were both literal and metaphoric, depicting exact events but also creating physical and personal associations for the viewer. Ideas are evoked in images rather than words (as the puns in the film titles may suggest, in their play with the ambiguity of language). This was to characterise much of her later work, although she also made a long 'talkie' video with her mother called Almost Out (1984), whose title and theme suggest birth and beginnings. Here, the naked mother is filmed and questioned by the daughter in a TV studio, surrounded by monitors, while the daughter is similarly filmed and questioned by an unseen cameraman (her former tutor and mentor at Canterbury, Pierre Attala Lapierre). The search for identity borders on transgression in this striking video, whose documentary rawness is equally shown as mediated within a formal structure that reveals its own artifice.